It took AlphaZero only a few hours of self-learning to become the chess player that shocked the world. The artificial intelligence system, created by DeepMind, had been fed nothing but the rules of the Royal Game when it beat the world’s strongest chess engine in a prolonged match. The selection of ten games published in December 2017 created a worldwide sensation: how was it possible to play in such a brilliant and risky style and not lose a single game against an opponent of superhuman strength? 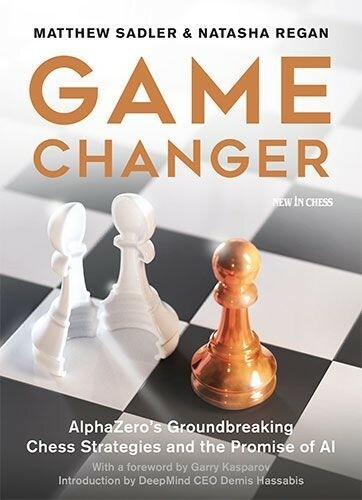 For Game Changer, Matthew Sadler and Natasha Regan investigated more than two thousand previously unpublished games by AlphaZero. They also had unparalleled access to its team of developers and were offered a unique look ‘under the bonnet’ to grasp the depth and breadth of AlphaZero’s search. Sadler and Regan reveal its thinking process and tell the story of the human motivation and the techniques that created AlphaZero. Game Changer also presents a collection of lucidly explained chess games of astonishing quality. Both professionals and club players will improve their game by studying AlphaZero’s stunning discoveries in every field that matters: opening preparation, piece mobility, initiative, attacking techniques, long-term sacrifices and much more.